The chair consists of a shaped and carved top rail with finely carved drapery and tassel decoration to the top leading down to the finely carved pierced splat. This leads down to the walnut arms (replaced at some time, please see below) being carved in the form of goose heads and leading down to a drop in rush seat, the front rail having a moulded edge with carved gadrooned decoration below. 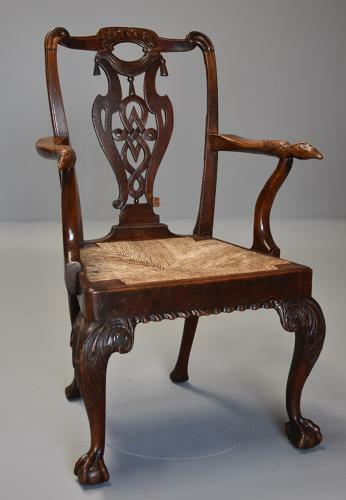 The front legs are a well shaped cabriole design with acanthus carving to the knee leading down to a ball and claw foot, the back legs having an unusual square foot for this period of chair. We feel this chair has possibly come out of the workshop of a good cabinetmaker due to the various sophisticated influences of design it has and was maybe used as a guide or template for chair designs in his workshop. There is evidence of the original arms being replaced with the present arms some years ago – the present arms on the chair are possibly those from an 18th century Dutch chair and also the back and one arm support have some wonderful attached metalwork. The replacement of the arms has been sympathetically executed and was possibly undertaken to improve the original arms and overall design of the chair as it is certainly a wonderfully proportioned armchair and a connoisseur’s piece.